Painting the downtown red | for Columbia transit! Did you notice something new and bright along Columbia St, headed west past 3rd Ave? The bright red “only bus” markings are one more step toward an eventual 2-Way Transit Corridor. The new vivid coloring underscores rules for lane use in that busy area, helping to keep buses moving through in both the current 1-way configuration, and future 2-way operations. The team took advantage of dry weather Saturday, October 27, to complete the thermoplastic installation on the northern most lane of Columbia St, between 1st and 3rd avenues. The Columbia St segment between 3rd Ave and Alaskan Way will be rebuilt and converted to 2-way operations, as part of the Waterfront Seattle project. Do you have questions about this effort? Visit the project web page, or contact the team at Columbia@seattle.gov or (206) 316-2545. The Nickerson Paving Project is beginning 17 consecutive days of work, making improvements between 15th Ave W and 14th Ave W. To strengthen the road base and repave this principal arterial and major truck route/transit street, the interchange at W Nickerson St and 15th Ave W must be closed October 5 – 22. Closed movements during W Nickerson St and 15th Ave W interchange work. To help clarify alternative routes during this time, we’ve made the following maps. Also, see below for updated work hours. Note, the work is weather dependent, so timing may change. 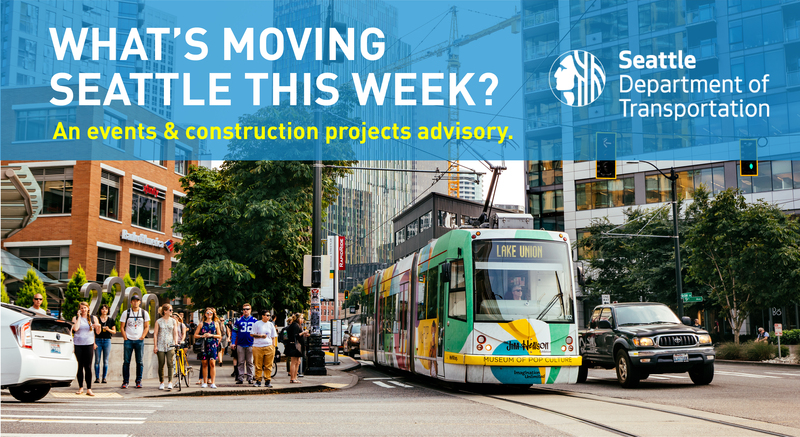 If you have questions, please contact us at NickersonPaving@Seattle.gov or 206-256-5252. W Nickerson St/15th Ave W interchange closed for repair and repaving. Bus Routes 29 & 31 – Rerouted from W Nickerson St to 14th Ave W; and W Dravus St, intermittently. Please check with King County Metro for more information regarding altered bus routes. Street parking on 14th Ave W around work area suspended during the October 5 – 22 closure. *Drivers – A – E closed movements detour maps below (click maps for larger version); detour text descriptions on the project website. Contact us directly at NickersonPaving@seattle.gov or (206) 256-5252 (voicemail line). Visit our website to learn more about the project.